Mañjuśrī is an archetypal Bodhisattva associated with Prajñāpāramitā or the Perfection of Wisdom. Recently I became interested in his sword because it doesn't quite seem right for a Mahāyāna figure, nor for a peaceful deity, to be holding an implement that is more typical of wrathful figures. Bodhisattvas as objects of separate cults emerge relatively late in comparison to their appearances in texts. So for instance Mañjuśrī appears in early texts like the Viṃalakirtinirdeśa Sūtra (1st or 2nd century CE) but there are no representations of Mañjuśrī in Indian Buddhist art until the 6th century. Although I can't confirm this, it seems to me that the appearance of (large scale) iconographic representations of Bodhisattvas other than Maitreya appear to coincide with the early period of Tantric Buddhism. It also seems likely to me that individual Bodhisattvas were not worshipped widely in India until that time. In China a cult of Mañjuśrī appears a century or two earlier, but it takes a different form to that in India and is centred around Mount Wu Tai. The earliest representations of Mañjuśrī, whether Indian or Chinese, do not show him with a sword. The earliest Indian iconography shows him with right hand in the varada mūdra, left hand holding an utpala lotus; his hair is braided, and he wears a tiger's class necklace. (see image left) The last item is a protective amulet worn by children. In early Chinese images however he is shown teaching and holding an iron staff. This staff, which broadens at the top, is a Confucian implement symbolising religious discourse. The Viṃalakirtinirdeśa, which features Mañjuśrī in a discussion with Vimalakirti, was a key influence on Chinese iconography. Rob Linrothe's study of wrathful images, Ruthless Compassion, provides a clue to what might have happened. Although Mañjuśrī himself is not shown with a sword, he and other Bodhisattvas such as Vajrapaṇi are frequently accompanied a smaller companion figure who does. The dwarf-like figures seem to derive from Śaiva images of the dwarf Vamana. In particular Mañjuśrī is accompanied by a figure called Yamāntaka. Yamāntaka, of course, goes on to become a distinct figure and plays a very important role in Tibetan Buddhism. However at first he is very much linked to the peaceful form of the Bodhisattva and seems to represent the "power" of the Bodhisattva. Importantly Yamāntaka is depicted as wielding a sword in these images. In the case of Mañjuśrī I suggest that he got his sword from Yamāntaka, but only after they had gone their separate ways which was evident by about the 10th century. But why would a peaceful Bodhisattva take up a sword, even a so-called sword of wisdom? The sword culturally speaking represents the polar opposite of Buddhist values - it is an implement of killing, designed in fact for the single purpose of killing humans. A possible answer is provided by Adalbert Gail in his paper "Mañjuśrī and his sword" (see below). He suggests that the cult of Mañjuśrī began in China, which explains why images of Mañjuśrī appeared there centuries before they did in India. We know that in some cases, the Heart Sūtra being a classic example, that Chinese Buddhism had an influence on Indian Buddhism. 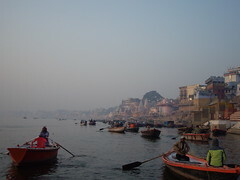 In ths case Gail surmises that the iron discussion staff was an implement unfamiliar to Indian Buddhists, and so when they met it, probably via Chinese pilgrims in India, they may have assumed that it was a sword. By this time wrathful images, such as Yamāntaka had already appeared so a Buddhist figure holding a sword may not have seemed so unusual. Later images of Mañjuśrī holding a sword were taken to China where they became popular. Much of this argument is speculative and will likely remain so, but it seems a plausible account given what we do know. The story of Mañjuśrī's sword is a good example of how iconographic, non-textual information, all too often overlooked by Buddhists and Buddhologists, contributes to our understanding of Buddhist history. Linrothe, Rob. Ruthless compassion : wrathful deities in early Indo-Tibetan Esoteric Buddhist art. London : Serindia Publications, 1996.
image: Mañjuśrī accompanied by Yamāntaka (with sword), ca 8th century, Nalanda in Linrothe, p.68. NOTE: In writing this essay I missed an obvious reference to Mañjuśrī's sword in a Mahāratnakūṭa Sūtra called the Suṣṭhitamati-paripṛcchā. A little more research would be required to see if the date of the text has been established - the Ratnakūṭa (or Jewel Heap) texts are a collection which span a period time but begin to be translated into Chinese about the 2nd century. In this text Mañjuśrī moves as if to kill the Buddha with his sword! He is stopped by a discourse on the emptiness of beings. If I were to rewrite this essay in light of that passage it would probably look entirely different. I wonder why neither Linrothe nor Gail mention it as it has direct bearing on what they write about, perhaps like me they simply over looked it? A translation of the passage can be found in Chang, G. C. C. 1983. A treasury of Mahāyāna Sūtras : selections from the Mahāratnakūṭa Sūtras. Pennsylvania : Buddhist Association of the US, p.68. See Also Sangharakshita. 1985. The Eternal Legacy : an introduction to the Canonical Literature of Buddhism. London : Tharpa. p.186. About 10 years ago I read Peter Harvey's article on Culpability in the Vinaya, and was taken by the story of the Mad Monk. His name is.... wait for it.... Gagga. I immediately went looking for some etymological link between the name and our English word for someone who is mad, and found that the two are, sadly, totally unrelated. The English "gaga" - meaning mad - comes from French and is thought to be imitative; while the name from the Pāli means "swift flowing" and probably relates to the name of a river. The case of Gagga provides a very interesting window into the process of making Vinaya rules. Gagga is intermittently mad and unreliable. We know little more than this about him. Due to his bouts of madness he frequently did not answer the summons to the convocation of bhikkhus. Also Gagga was prone to breaking the vinaya rules and not remembering what he did. This lead to the development of two rules. I should point out that the understanding of madness at this point is relatively sophisticated, and is clearly distinguished from possession by an evil spirit for instance. Madness is characterised in much the same way that we would now - a mad person comes to the wrong conclusions about their experience - confusing the subjective and objective. I'm not going to say any more about definitions of madness because they are so contested and conflicting that no precise definition is satisfactory. There is a tendency in the West to both romanticise madness on the one hand, and to demonize it on the other. We may associate madness with spiritual visions (I'm thinking for instance of William Blake), or with high spirits. Those who have recovered from Madness and written about it, however, talk about it as nightmarish. On the other hand we may think of all mad people as homicidal psychopaths, whereas in fact most mad people are a danger only to themselves. Also note that the figure of Gagga may not have existed, but may be a cipher for any bhikkhu with madness - he may simply be a story telling device. I discuss him as a person, but keep in mind that there is no other evidence that he lived. Gaga, then, does not show up for meetings. [Vin. i.123] All fully ordained bhikkhus were (and still are) required to come together regularly to recite the patimokkha and to formally discipline any bhikkhu has broken any of the Vinaya rules. By not turning up when called Gagga was disrupting the life of the Sangha. In this case the Buddha allows the bhikkhus to decide that someone is mad, and to carry on without him. Gagga also breaks the rules. [Vin II.82] Peter Harvey discusses this aspect in his article. In the first place Gagga is accused of an offence but denies it. The bhikkhus do not accept his denial and go to the Buddha, but the Buddha says they must accept that if he says he cannot remember, that he is telling the truth. This ad-hoc decision is also later codified so that in many places madness is cited as a reason that a bhikkhu is not culpable for his actions. Here we see the movement from ad-hoc to general rule. I have not followed this up, but the two examples of rule making which centre around Gagga make me think that this process must have been influential in the development of the vinaya. It was not the only process though, for example rules are often made because laypeople complain directly to the Buddha about the behaviour of the bhikkhus. Apart from the insight that this gives us into how the vinaya developed, I want to note one very interesting point about Gagga. Despite being rather troublesome, as mad people can be, the response in the vinaya is not to expel him. There is no suggestion that Gagga's affliction put him outside the Sangha, even when he has consistently broken the rules. Madness is deemed to be an affliction rather than a moral failing. Someone who is mad, according to the vinaya, cannot be held responsible for their actions while mad. At some point I'd like to do a comparison of this attitude to the changing Western attitudes to madness collated by Michel Foucault in his book Madness and Civilisation. I can briefly say that the attitude in the vinaya appears to be different from Western attitudes at any point in our history. In Europe mad people were initially tolerated unless they became disruptive when they might be driven out of town. With the valorisation of reason in the Renaissance, madness was seen as moral failure. Lazar houses standing empty with the drastic reduction in leprosy began to be filled with the mad. Freud led a change in attitude to madness - from a moral failure to medical condition. These days the "chemical imbalance" theory is beginning to give way to a genetic paradigm. In other words, and this is what seemed to attract Foucault to the subject, the way we understand madness and treat the mad reflects the currents in wider society. The attitude to madness in the Pāli canon may well afford us insights into early Buddhist society - at least the idealised form of it that is represented in canonical texts. Anyone familiar with the story of Kūkai will know that his journey to China in 804 began by sailing from Nagasaki out into the Sea of Japan. It is usual to comment on the relative lack of seaworthiness of the Japanese ships, and on the lack of nautical knowledge of the sailors since they sailed at a time when the winds were against them, meaning that the rudimentary sails could not be used; and when typhoons regularly swept in wrecking any ships daring to be out of harbour. This is a given in all the biographies in English. However as long ago as 1995 TŌNO Haruyuki cast doubts on this way of telling the story, at the same time as questioning another long held belief: that the Japanese Emperors presented themselves as equals to the Chinese Emperor, and that the Chinese went along with this. This latter is interesting because it sheds light on the nature of the embassies sent from Japan. Tōno shows that there is evidence to throw doubt on the supposed equality of the two emperors. It is true that as early as 607 a mission to the Sui dynasty emperor Yang-ti (隋煬帝 ) presented a letter which described the Japanese emperor as Son of Heaven, the title of the Chinese Emperor, however Yang-ti saw this as an affront. Tōno's article concentrates on the embassies to T'ang China. In 632 a Chinese imperial envoy clashed with the Japanese court over protocol and did not read the letter from the Chinese Emperor. Tōno suspects that this was an attempt to subdue the Japanese. Note that this was a period of massive expansion westwards, with Chinese troops pushing on past the Tarim basin, where they were stopped by an Arab army also intent on expansion. It was the time of the greatest extent of the Chinese Empire. Until 663 the Japanese were influential in the Korean peninsular. However in that year the Paekche (from whence Buddhism was introduced into Japan in 552) were defeated by a coalition of the T'ang and Silla, despite being shored up with Japanese forces. In 668 the alliance defeated the Koguryo thus unifying Korea. Although the Japanese continued to see Po-Hai (in present day Manchuria) as a tributary state, Tōno points out, from this time onwards it would not have been possible for the Japanese to insist on equal status. Indeed the embassy of 671 can be seen, according to Tōno, as a declaration of surrender! After a break of 30 years another embassy was sent to the T'ang court in 702. It was at this time that the Japanese concede to paying tribute every twenty years. This was a pragmatic move on the the part of the Japanese in the face of a rampant T'ang state in the process of crushing opposition in other quarters. Evidence of this promise, more or less hushed up at home, is seen in a letter from a monk on Mt T'ien T'ai who is asking for permission to pass on information to the Japanese monk Ensai in 840 where he mentions that "... and they [the Japanese] have promised to pay tribute once in twenty years" (p.45). This would not have been common knowledge in Japan, and though careful records of many other occasions were kept, letters from the Chinese Emperor were mostly lost. In one letter from the Chinese Emperor 735 begins by writing "I order the king of Japan..." (p.52). It obvious that in the Japanese mind Japan was the centre of civilisation. The ritsuryō code for instance, despite being modelled on a T'ang Chinese legal code, refers to other nations including the Chinese as barbarians. Tōno cites the fact that no one of the royal family ever went to China as this would have admitted to the Japanese people that they were subordinate. Although Tōno does not mention it, we could also comment on the relative weakness of the Japanese nation until the reforms of Kanmu began to take effect. Japan had been essentially bankrupted by a succession of natural disasters and the flurry of temple building that ensued as a remedy, and by a number of expensive and sometimes disastrous military campaigns against the Ainu. In Kūkai's day there was forced labour and military service. Many people were homeless, and farming so difficult that many left the land to become beggars. In the face of a strong and dynamic T'ang Japan would have looked weak, and perhaps it is only the long sea distance that prevented them from being assimilated along with other neighbours. Tōno's conclusion is that the embassies to the T'ang court were to offer tribute as agreed in order to keep the Chinese Emperor from casting a military eye eastwards. It is this fact which gives us the clue to why the embassies were sent when they were. As I mentioned it is common knowledge that Summer is a bad time to sail to China; and it is assumed that the Japanese were simply ignorant of the seasonal winds. However Tōno reminds us that emissaries from the Po-hai state regularly visited Japan at the time, and judging by their arrival and departure dates they were adept at using seasonal winds. (p.58) Tōno also argues that the Japanese ships were more sophisticated than has previously been thought, that they used cloth sails in addition to bamboo matting. However they did lack keels which meant they could not use the sails unless the wind was behind them. The offering up of tribute to the Chinese court was ideally done at the New Year celebrations - the Chinese year beginning on the second full-moon after the winder solstice, usually sometime in February. The average travelling time to China for all of the missions, which can be worked out from a chart in Tōno's article, was six months. This meant leaving in the 6th month, or late summer (July or August) in order to arrive in time for the ceremony in January or February. Far from being ignorant of nautical and seasonal knowledge the Japanese probably knew exactly what to expect, but were forced for political reasons to attempt the crossing at this time. The knowledge of what to expect was probably what accounted for the reluctance of Japanese officials to go on such trips. After Kūkai's trip in 804-6 only one more Embassy was sent to the T'ang court. Perhaps this was because it was clear, even in 806, that the T'ang dynasty was falling apart. It staggered on until 906 but was racked by civil strife and war. In other words there was no longer any threat to induce a offering of tribute, and Japan had gotten onto a firmer footing as well. Thanks to Kūkai the Heian period was one of a flowering of Japanese culture as distinct from imported Chinese culture. TŌNO, Haruyuki. "Japanese Embassies to T'ang China and their Ships," Acta Asiatica. 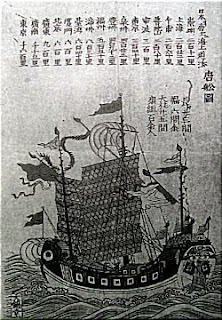 1995 v.69: 39-62.
image: Illustration of a Chinese ship of the type that would have visited Japan during the Edo period (from Tōno article).